Here's my most recent extremely easy art hack. I had a traditional silver frame my mom picked up at Goodwill for $4. It originally held a mirror, which broke in transit (sorry mom). 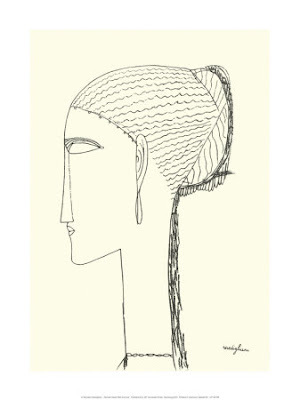 It took awhile, but I finally found the right replacement, a drawing of a female head by Amedeo Modigliani. I printed it out to the size of my frame and - here's the hard part - taped it to a window and traced it on piece of paper. I like how the spiral pattern in the frame echoes her braids. Tom thinks it's a little weird, but I love it. What more beautiful thing could you make with a piece of office paper and a pencil? Poor Amedeo died at 35, broke and obscure while his rival Pablo Picasso went on to design greeting cards for Ikea. 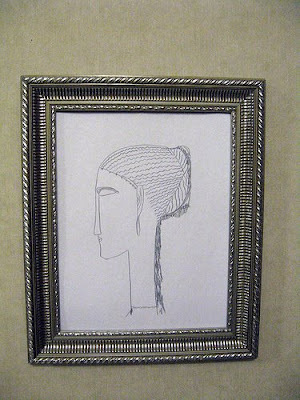 I have two Picasso hacks in my bedroom, also of women's heads. Out of respect, I moved the Amedeo to the kitchen. I'm just stuck here reading through your posts and really enjoying! !